Dandelion, parsley, arugula, romaine, radicchio, endive are all delicious, bitter greens of springtime that make perfect addition to salads! Why do bitter flavors matter? Bitter flavors of plants, while having a negative connotation to many, may be one of the keys to our wellness. Bitter flavors help stimulate digestion, bile production and can support healthy liver function. While Garlic Mustard continues to persist throughout our Great Lakes bioregion and threatens to crowd-out wildflowers and native vegetation, let us consider one of its virtues: It is an edible, bitter green. Harvest away, be sure to replace the area with other plants native to the area to help reestablish the disturbed space and prevent another Garlic Mustard Invasion (that could be a band name, hehe). One of the most popular ways to prepare Garlic Mustard is preparing it as a versatile, delicious pesto. Variations on pesto recipes can vary to suit personal taste preference and the flavor of the Garlic Mustard that is being harvested. Want to prepare a large batch? Pesto can be made without the nuts (they tend to taste rancid after thawing) and froze into ice-cube sized portions that will last for several months until the local Basil is ready for harvest here in Michigan. The pesto can be added to pasta, used in soups (like a French soup au pistou), served on crackers with cheese as an elegant appetizer, or even used as a base for a wild foods pizza of local Michigan Morels, homemade soft cheese, and wild onion. Add all to food processor, puree. Check flavor, add parsley, salt, pepper to preferred taste. Serve over crackers, on pizza, pasta, soup… the ideas are limitless and the pesto can be used in similar ways to traditional basil pesto. What is the adage, “A weed is a plant that is growing where you don’t want it?” Abundant in areas of disturbed soil – at the forest’s edge, along roadsides, and on river floodplains – the Garlic Mustard (Alliaria petiolata, Brassicaceae) is deemed by many as a noxious, invasive species, choking out native vegetation and spreading wildly across the state. The National Park Service describes the earliest appearance of the Garlic Mustard on the Atlantic coast to be documented in 1868. High in Vitamin C and a nutritious bitter green, it is believed that it was brought along by settlers to the area of Long Island, NY for food and medicinal purposes. Since that time in the 1800s, Garlic Mustard has spread south and west and has wrecked havoc on natural areas throughout the Eastern United States, particularly throughout disturbed areas within fields, floodplains, and woodlands here in the Great Lakes BioRegion. What makes Garlic Mustard able to take over so much area in so little time? Garlic Mustard thrives on disturbed land and areas under development. It is winter-hardy biennial plant and can reproduce lightning fast in its second year with its ability to produce hundreds of seeds once it goes to flower. And once the plant sets its seed, the seeds can remain viable in the soil for many years. So if you want it out, pull it as it sets out its showy white flowers (photo above). The early basal roots are more bitter in the spring, the fleshy stems less so – and it is sweeter in the fall after a frost. The roots are slightly nutty, and the second year plant should be harvested just before it flowers… But don’t get caught up in these rules — if you are pulling it to preserve other plants in your garden or a participating in a pull, use it and partner it with other flavors like parsley, walnuts and lemon to suit your palate! Want to learn more about wild edibles? 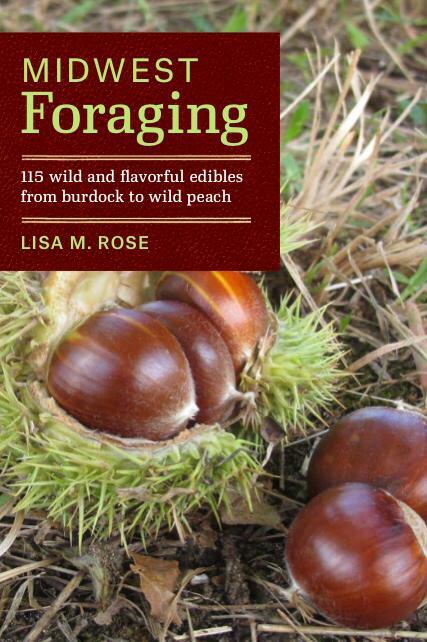 Check out my book, “Midwest Foraging!” Available online at Amazon.com. I love this post. I was wondering if I could make the pesto recipe without the garlic scapes. I haven’t been able to identify them on our property in Union City which is in Southwest Michigan.